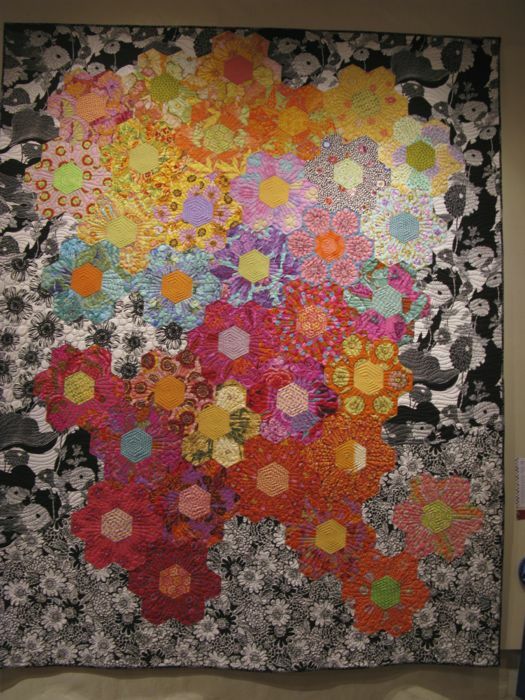 Springville Art Museum | OccasionalPiece--Quilt! 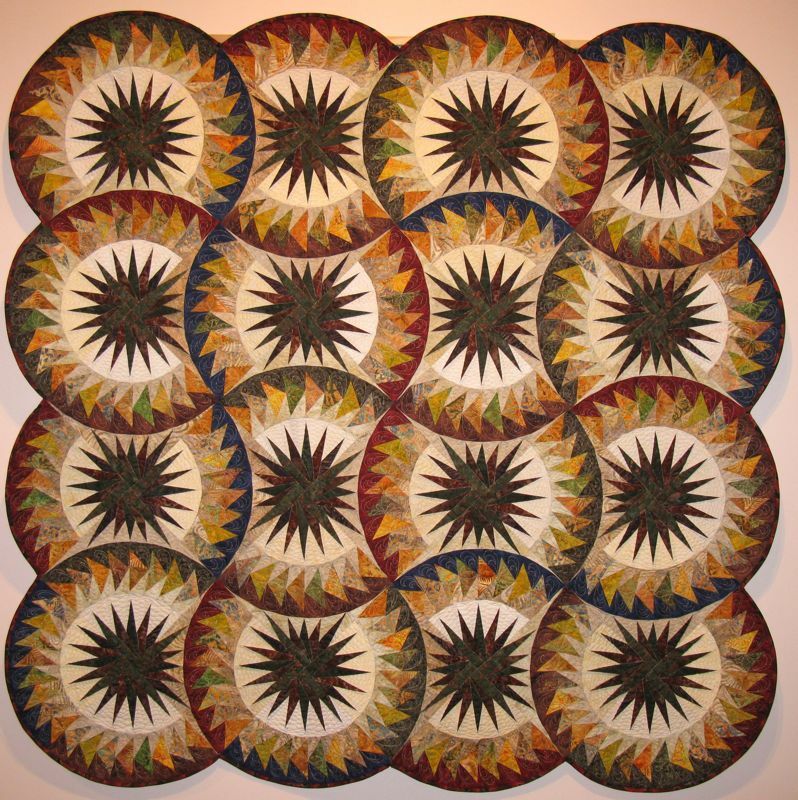 Posted on August 16, 2011 by Elizabeth E.
Again, so sorry not to have lots of interesting information for the quilters. Our dead desktop computer has gone to the shop (cue: violins) and we’ll find out if our fancy back-up external hard drive system has been working for us. Or if we should just start crying now. 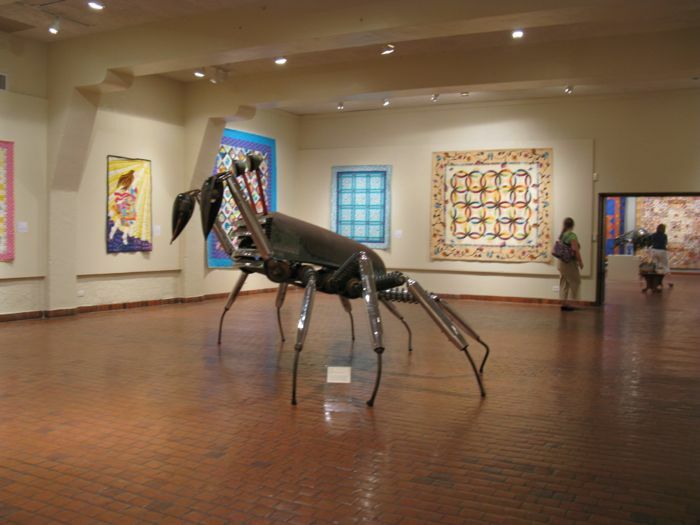 Okay, let’s look at art to take our minds off of the hum-drum of our very dull twentieth-century-computer-dependent lives. 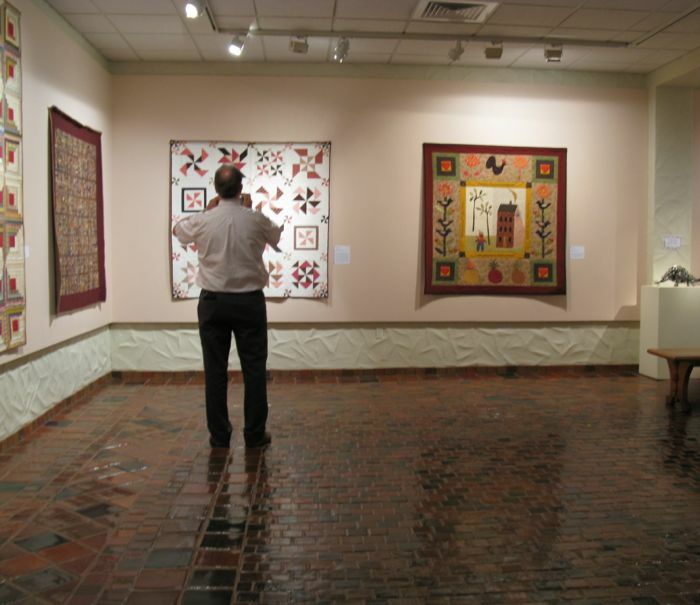 Upstairs, the museum has a lot of art from Russia; I’m giving you two of the paintings that just leapt off of the walls. 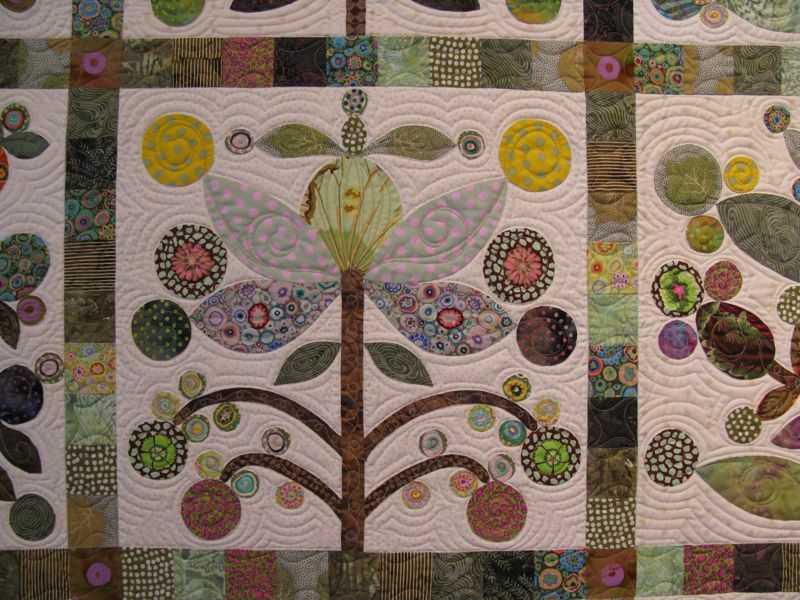 This one is my sister-in-law’s favorite, and I can only imagine it’s because of the beauty and hope and passion of these young girls on their graduation day. I wanted to take it home with me. 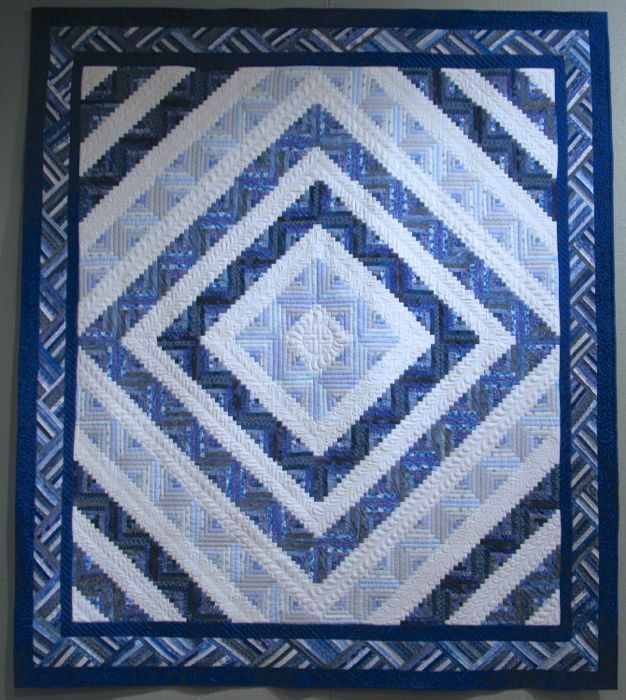 This one could be a quilt! 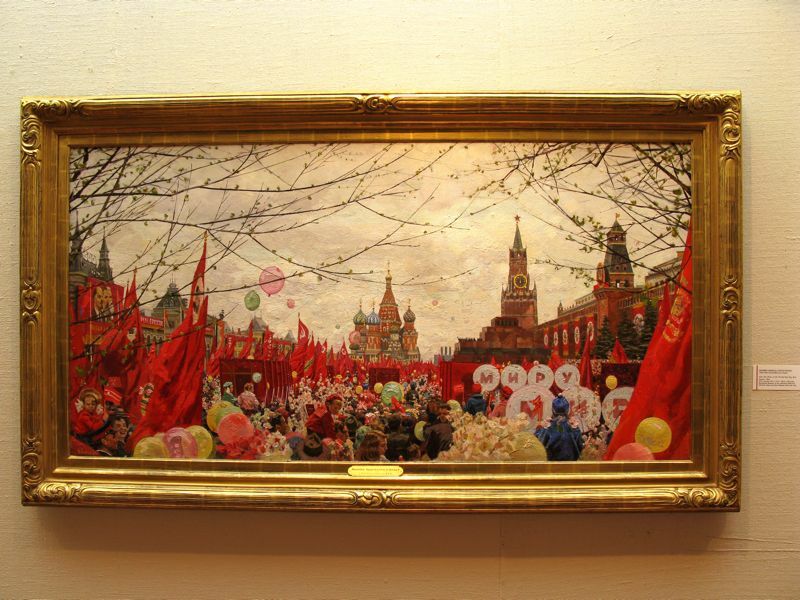 A May Day celebration, complete with balloons. 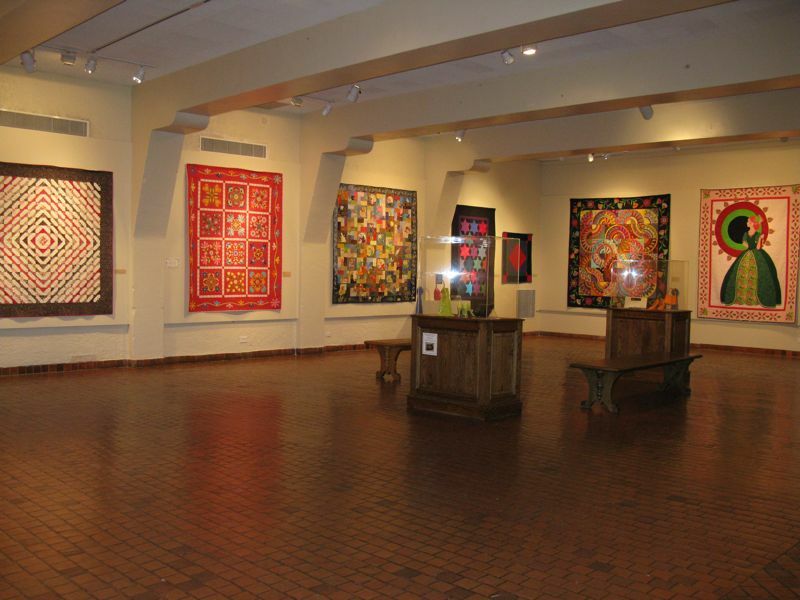 Here’s another exhibit room, and in the far right corner is another quilter who has the same thing on her mind as I do: the Lollypop Tree Quilt. 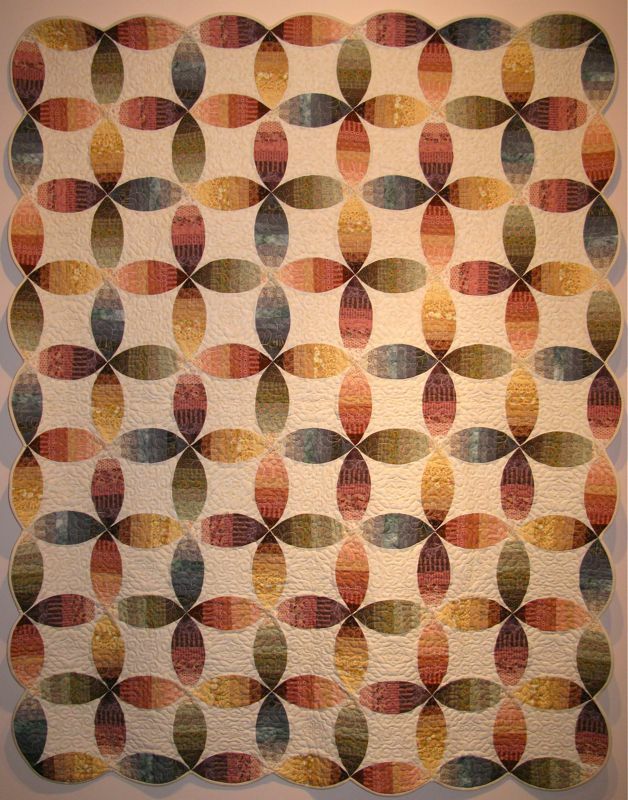 But Chris Manning’s version is stunningly different from the usual brilliantly lit up colors used on this quilt. 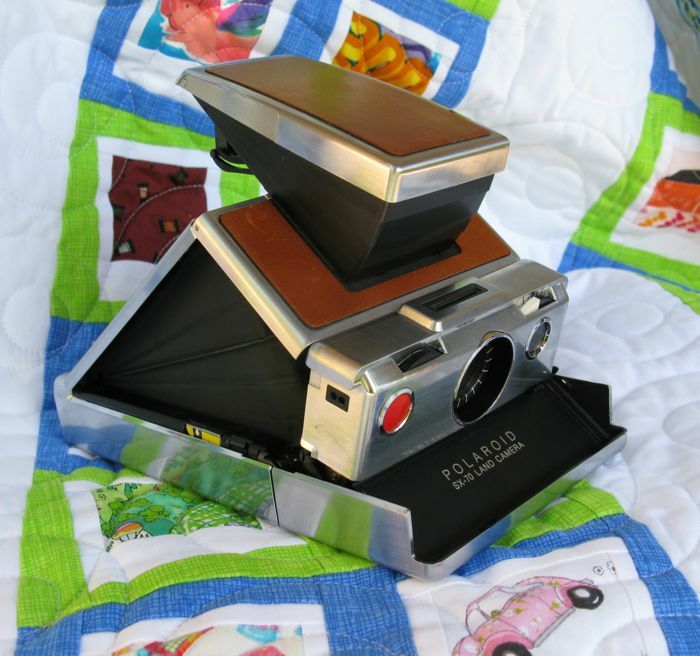 I took lots of photos–lucky you, you get to see them all. 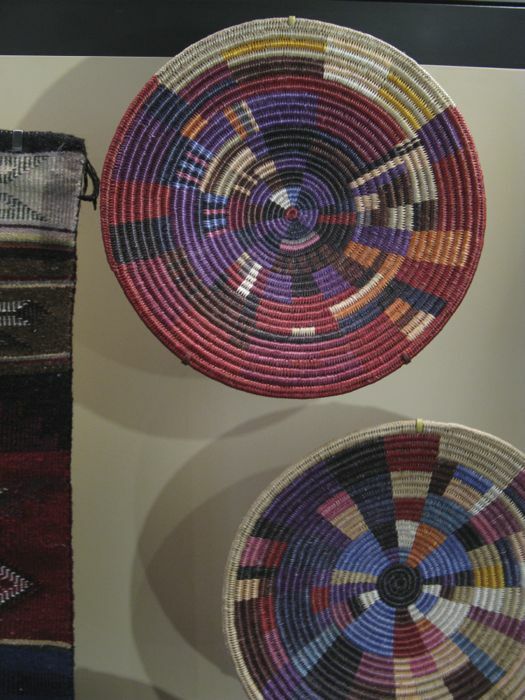 I was so impressed by this coloration. Really fabulous. Title: Lollipop. 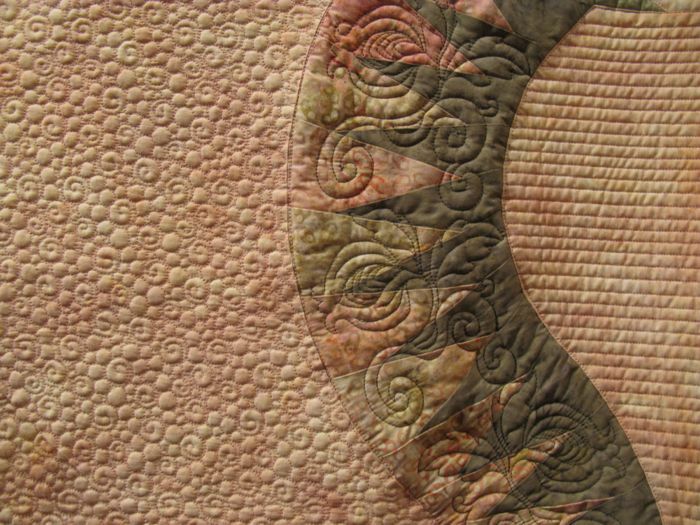 Those greyed-out greens, mossy colors work incredibly well with the pastels, the deep tones. 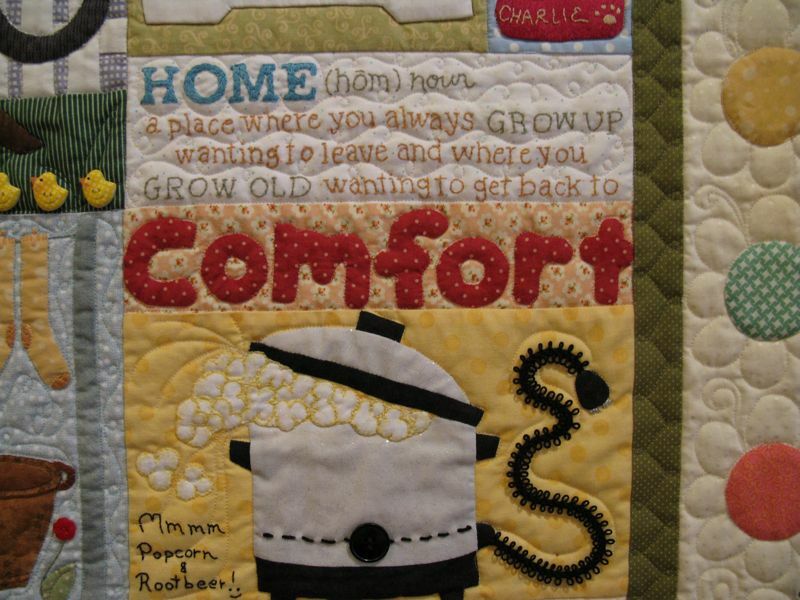 I covet this, really I do. Is it because it’s “done” or because it’s so beautiful in the tones and values and colors she chose. Both. 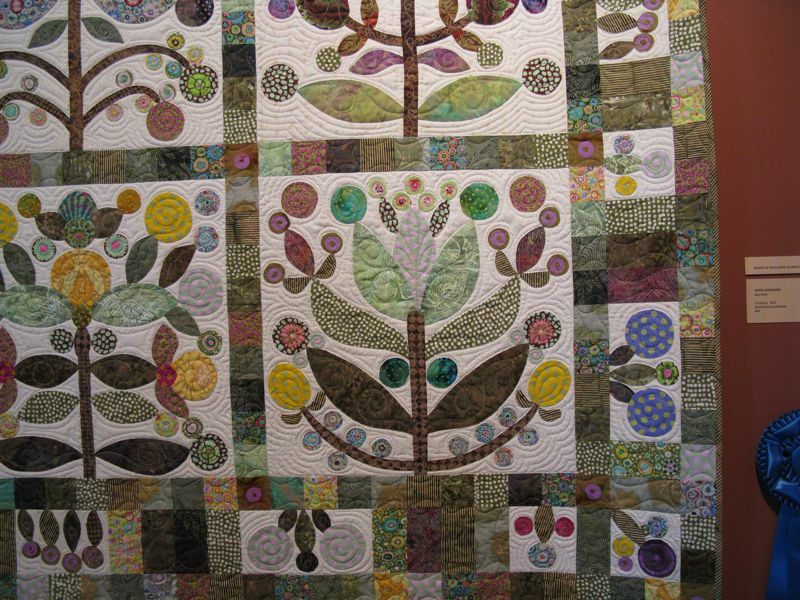 Sorry the lighting is so dim on this quilt, but you have to believe me when I tell you that Rhonda Montgomery’s quilt My Favorite Things, is a real knock-out in person. 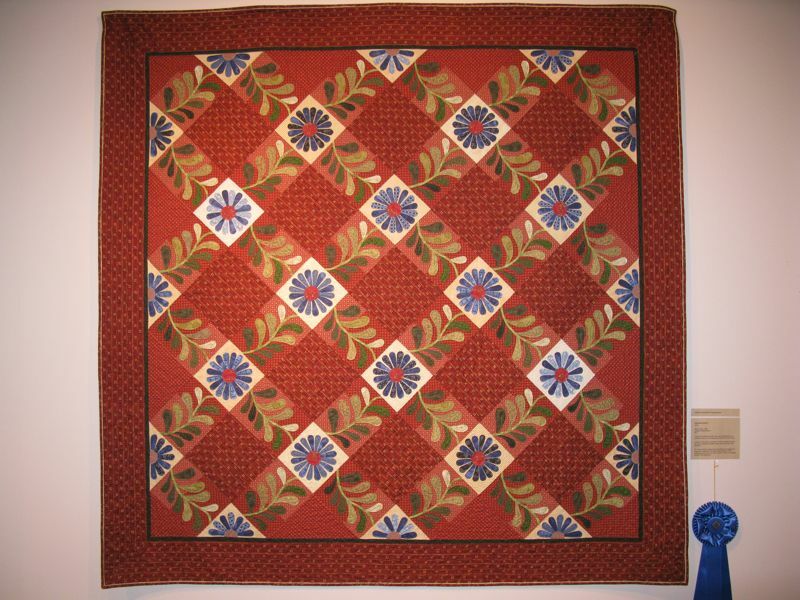 They had the quilts really well-lit, so the flash wouldn’t go off on my camera (I know, try reading the camera book to see how to do a fill flash. That’s next on my list–right after solving the computer problem). 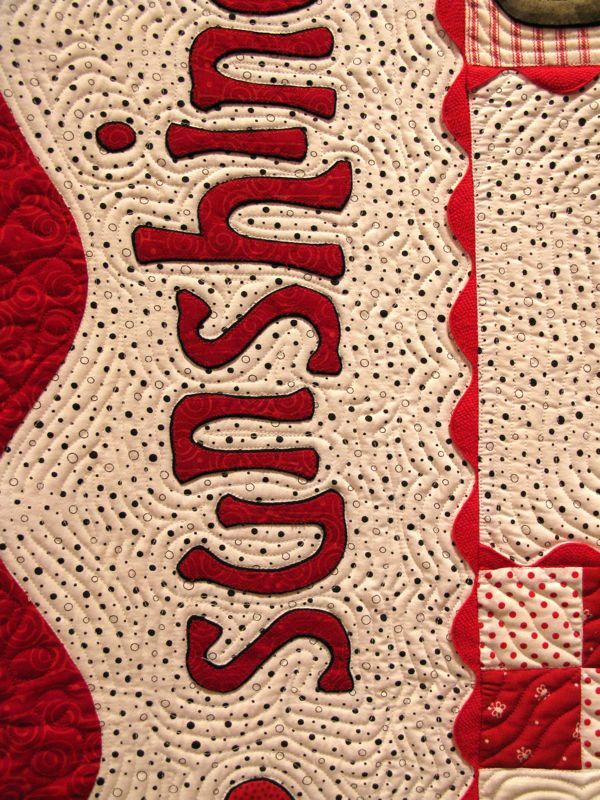 I peeked closely at these letters–either she went around each of them with a marker, or else it’s a very thin line of acrylic paint. 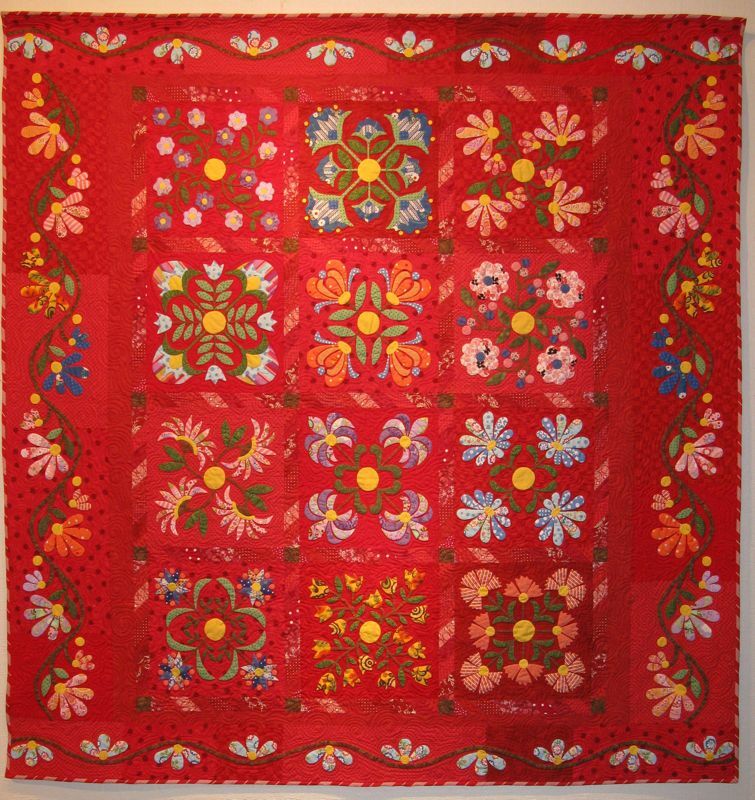 Whatever the technique, it made them pop off the quilt. 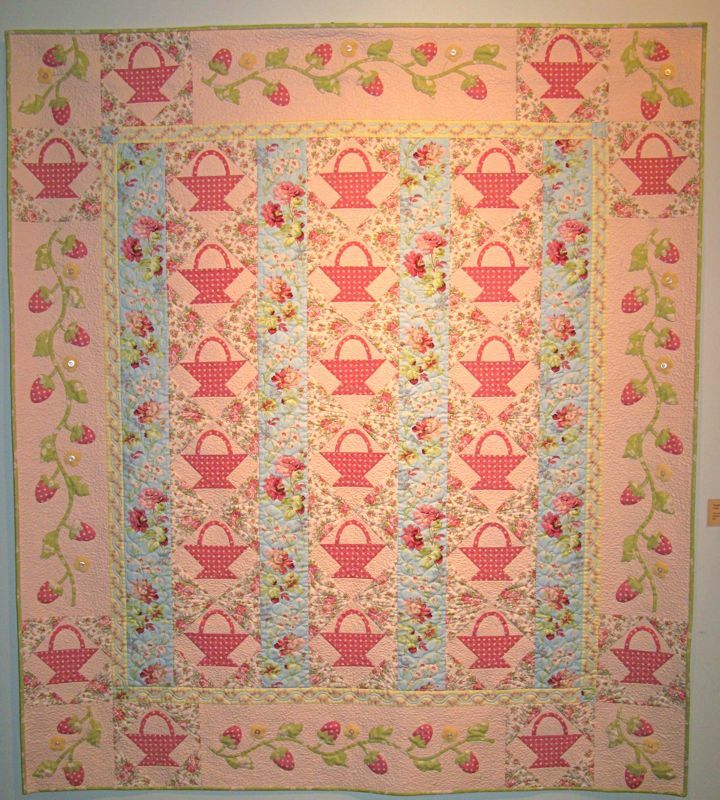 Brenda Sommers’ Grandma’s Lemonade Stand was in that room with all the deliciously pastel quilts–again, this photo doesn’t do it justice. So I read her name, and then wondered–don’t I know her? That name is so familiar. I think she used to live in my neighborhood, but I guess I’ll never know. 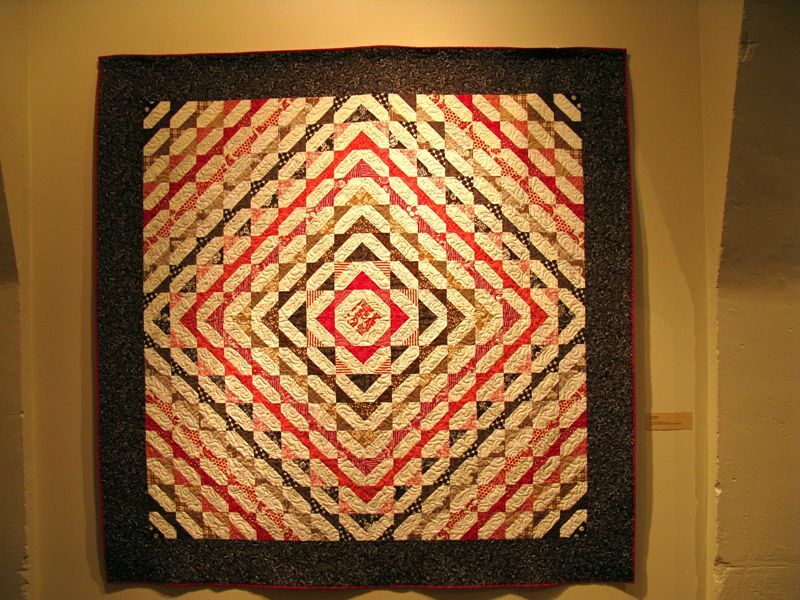 We quilters travel in a small world! 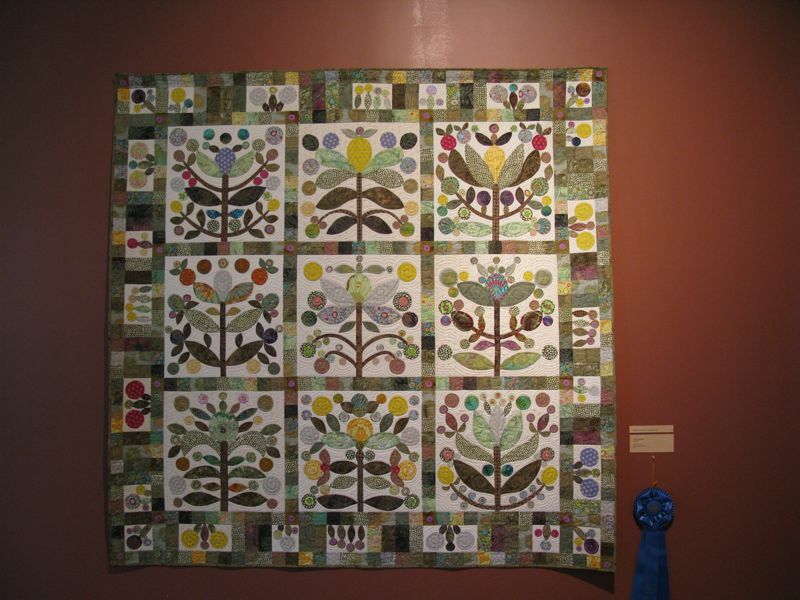 Julie Saville made this quilt, and I think it’s titled Road to Ohio. 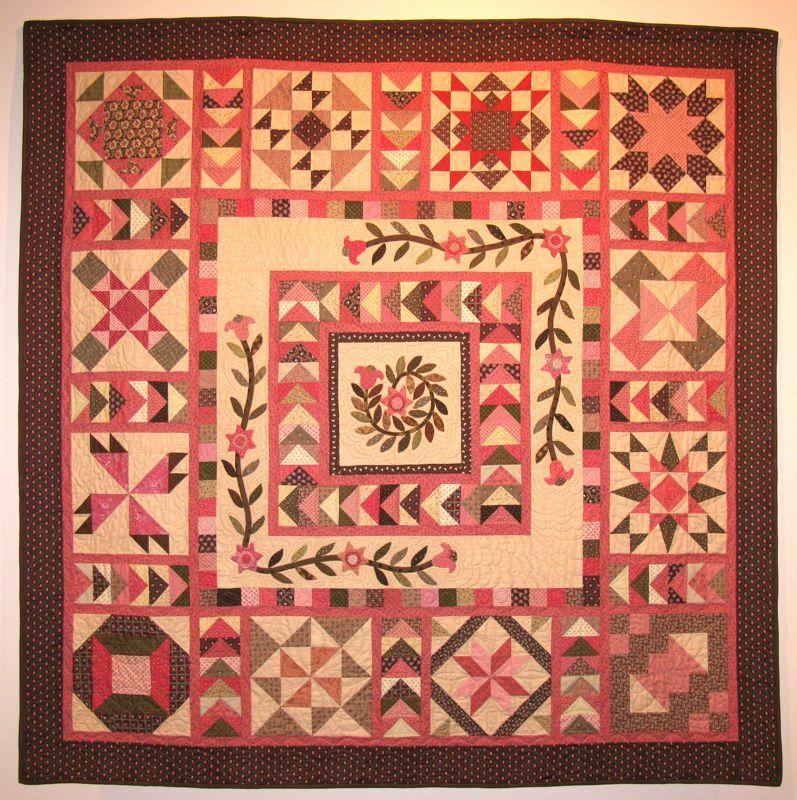 I love all the sampler blocks arrayed around the center medallion. 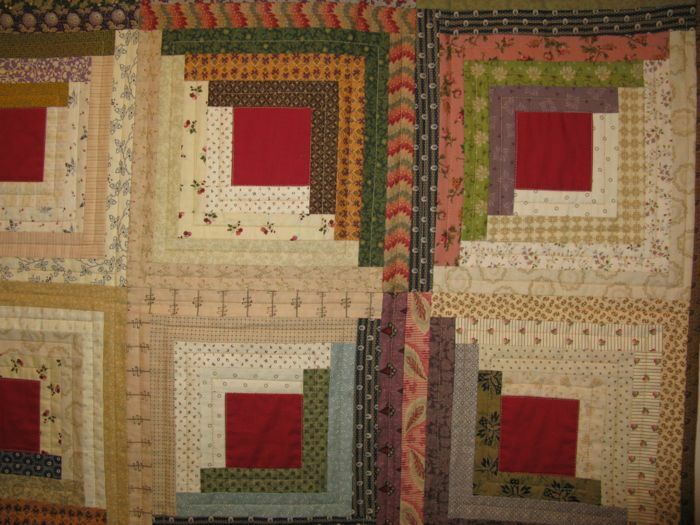 Sampler blocks seem to be popular right now, with a couple of Quilt-A-Longs going on. 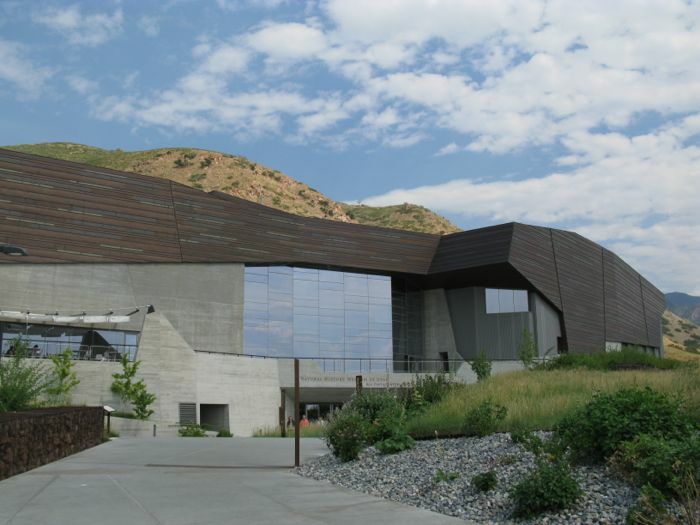 Here’s an idea for putting it all together. 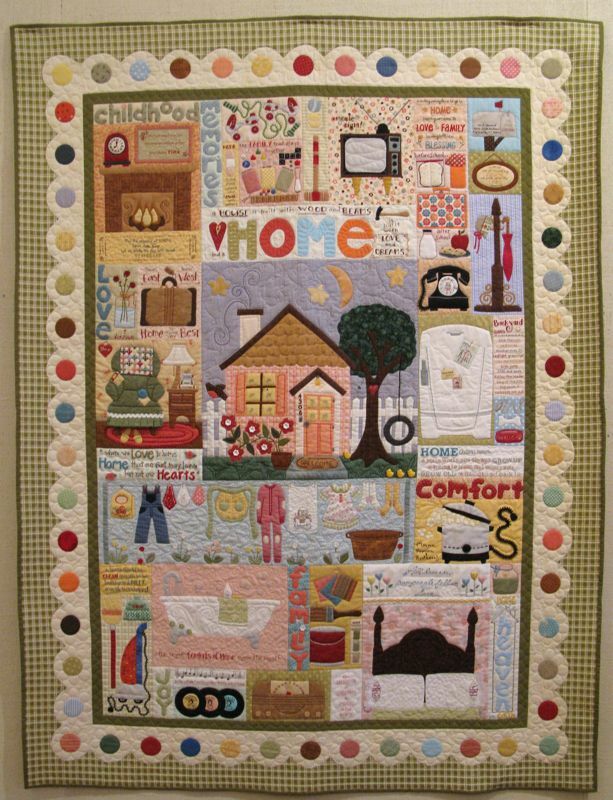 Kathy Young’s quilt, Not So Long Ago, is an homage to her childhood family and home. 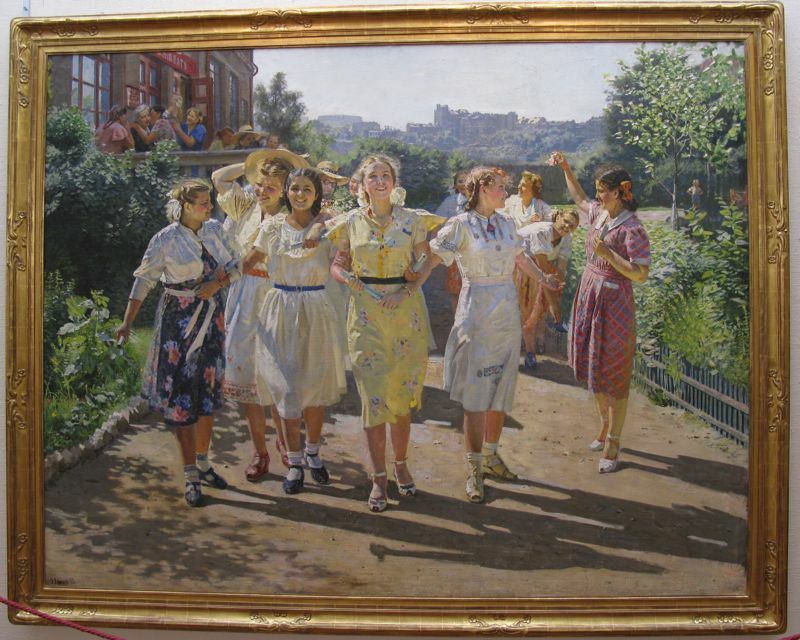 This reminded me of the May Day painting in the upstairs Russian galleries. 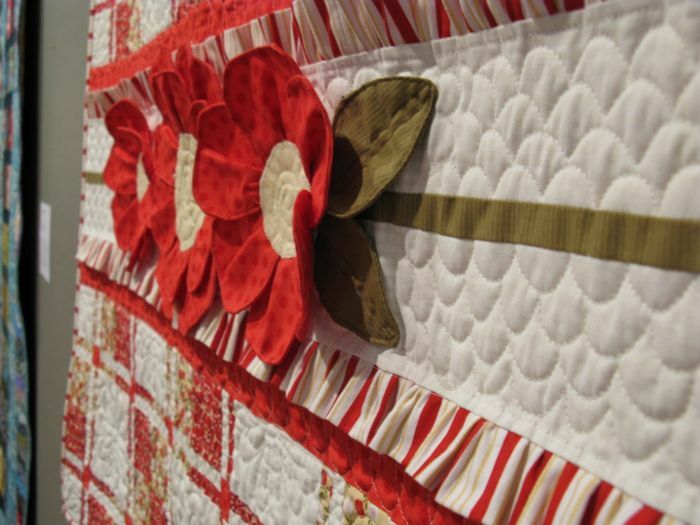 While I’ve been fixated on red and white quilts, this shows you what using red as a “neutral” can produce. 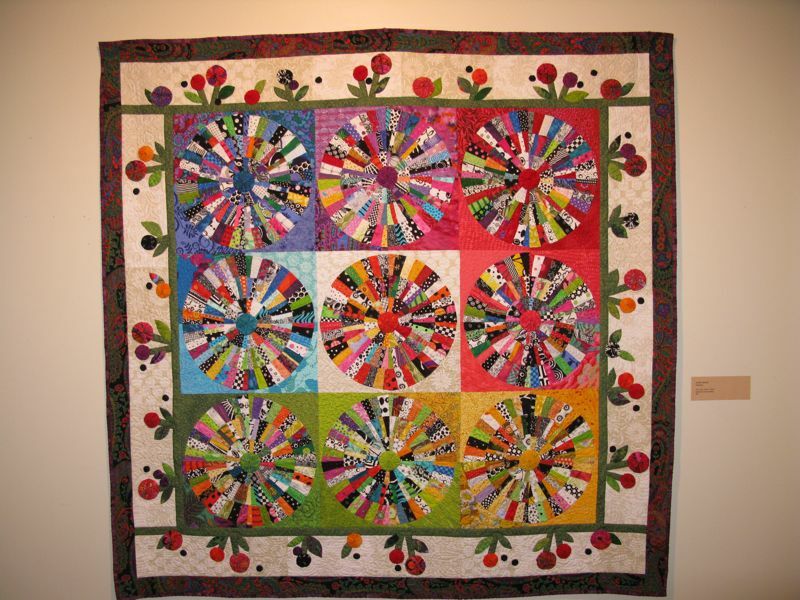 It looks like another Becky Goldsmith and Linda Jenkins design (like the dotty circles quilt, yesterday). 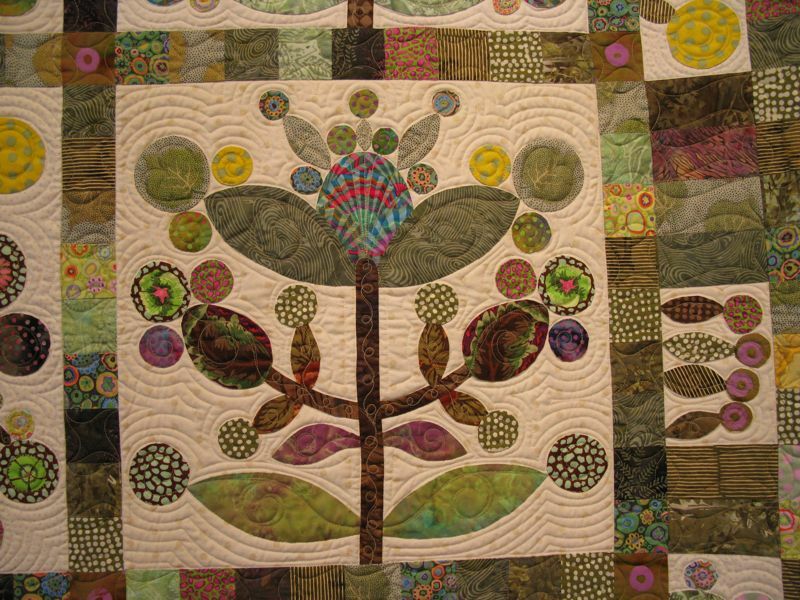 They keep us busy with applique! 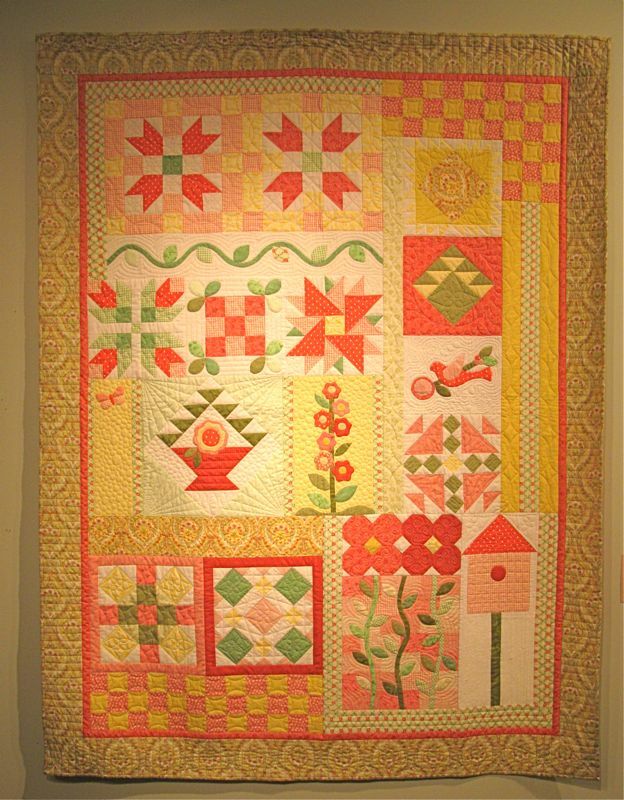 I believe this is titled Grandma’s Old Time Garden, made by Patsy Wall. 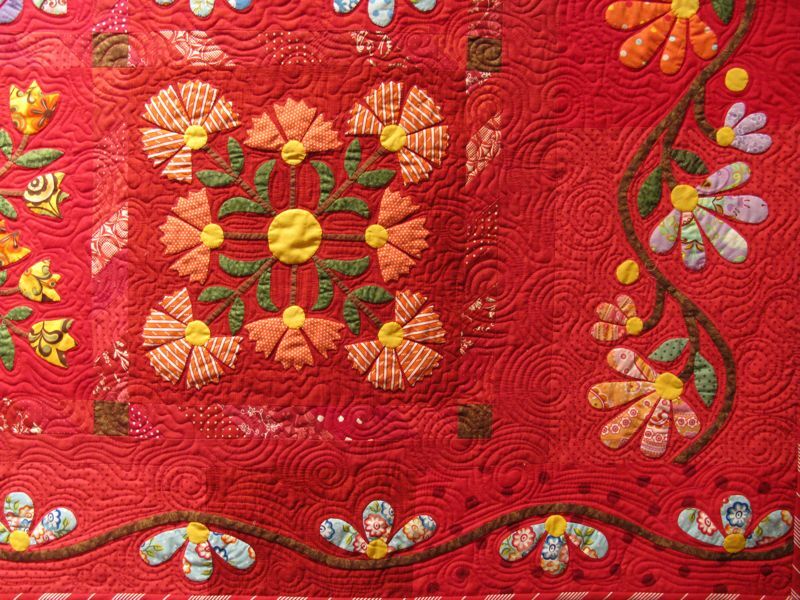 I love those carnations in orange-striped fabric! 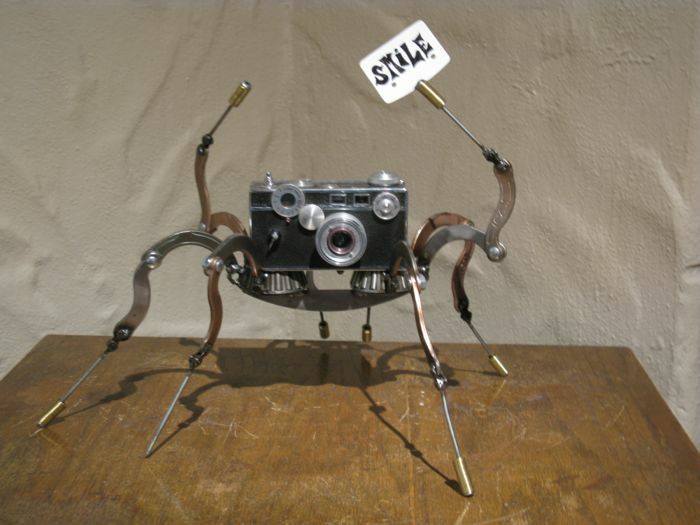 This is one where I have no idea who the maker is, nor the title. 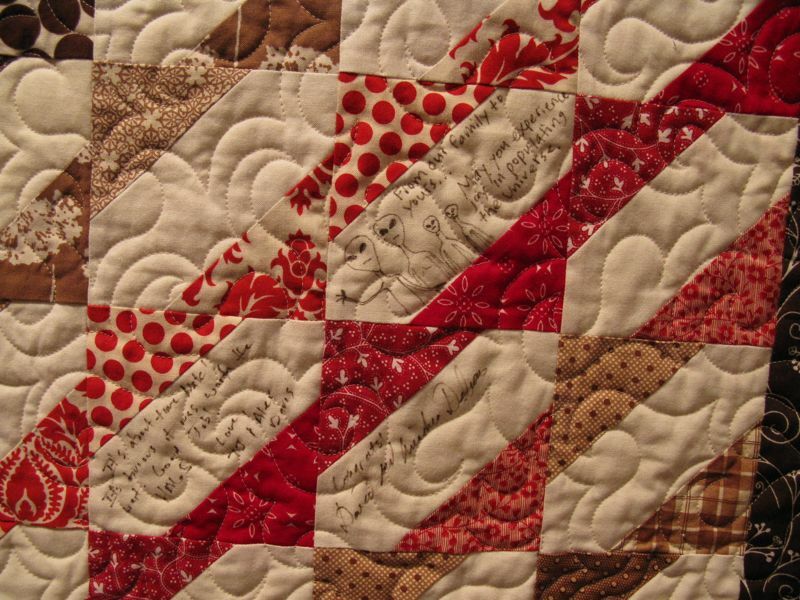 I apologize, but I include it even without that information, because I’m really impressed with her soft shading of color to color–using up lots of fabrics (an idea for a scrap quilt?) 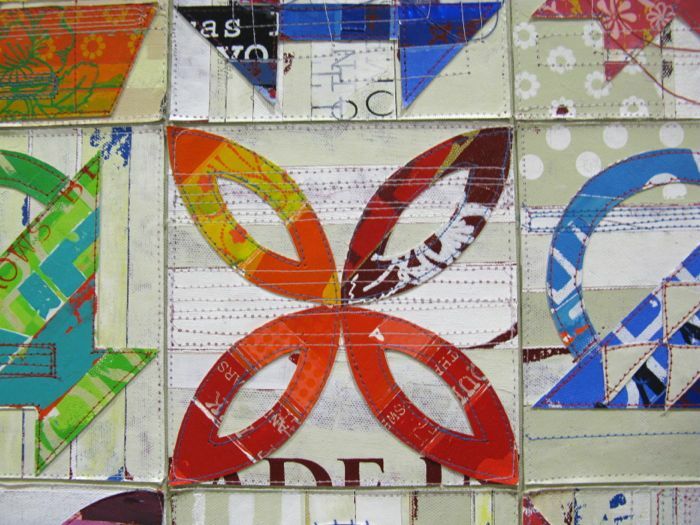 It quite possibly could be Carolyn Hulse’s Scraps of Rainbows, but I really don’t know. 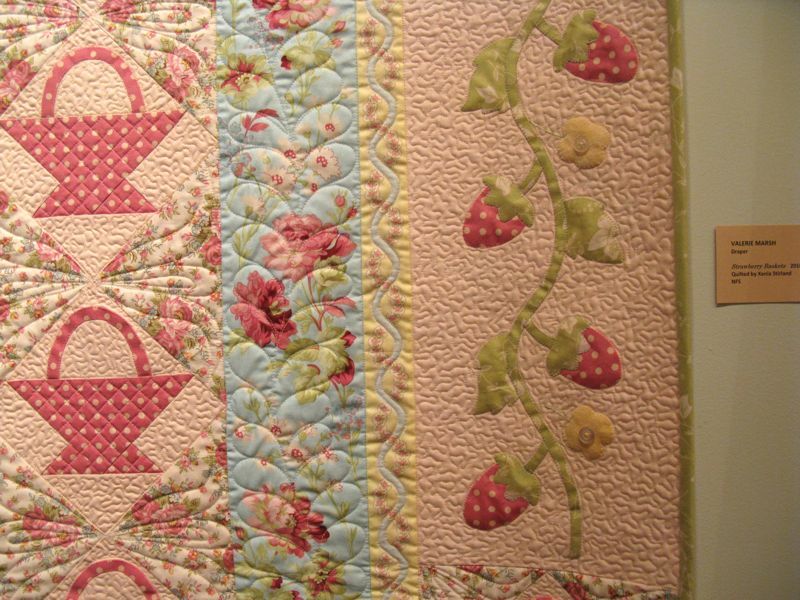 Strawberry Baskets is done by Valerie Marsh, and is another delectable pastel quilt. 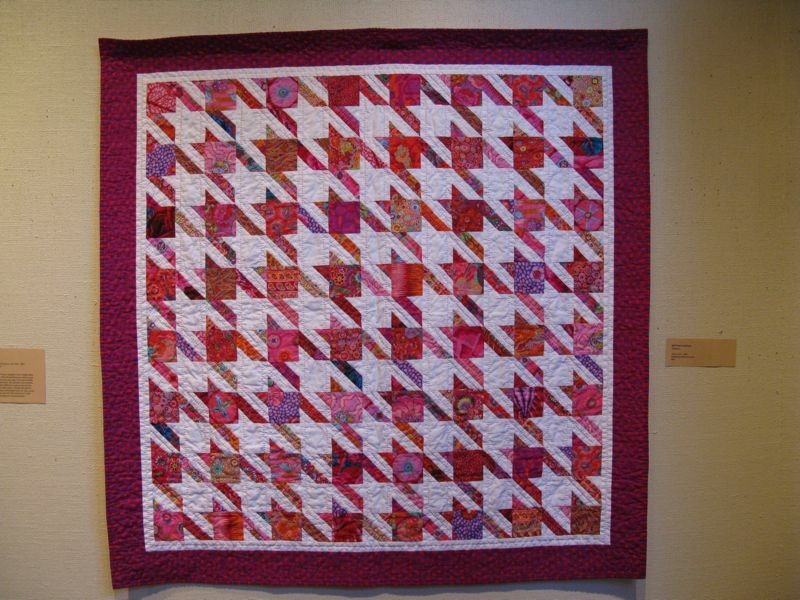 The quilting is quite amazing, and if I ever get the computer back–and restore its memory–I’ll let you know who did it. 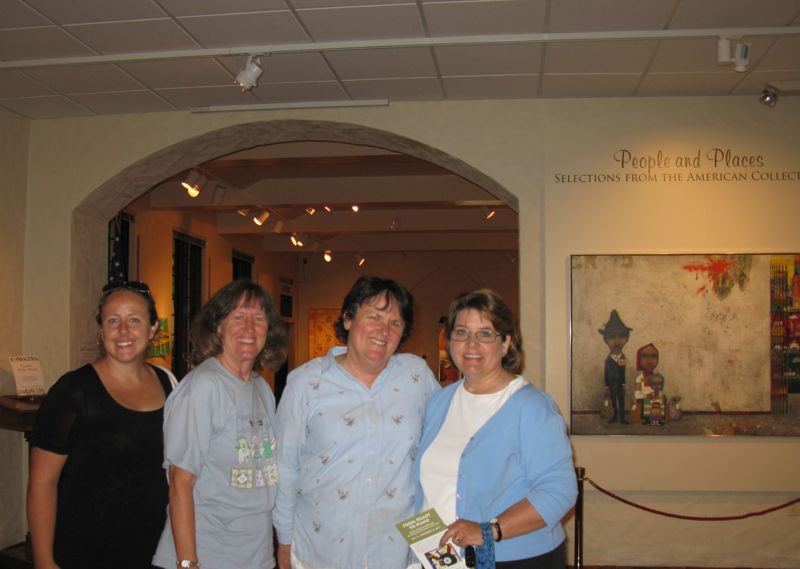 By the time Janice and I finished the show (I’m on the far right and Janice is next to me), our niece Lisa (in the black) had arrived and followed the sound of our voices to find us. Becky, another sister-in-law of mine (Janice’s sister) came just as Janice and I had to jet–and she brought me two gigantor zucchini from her garden! 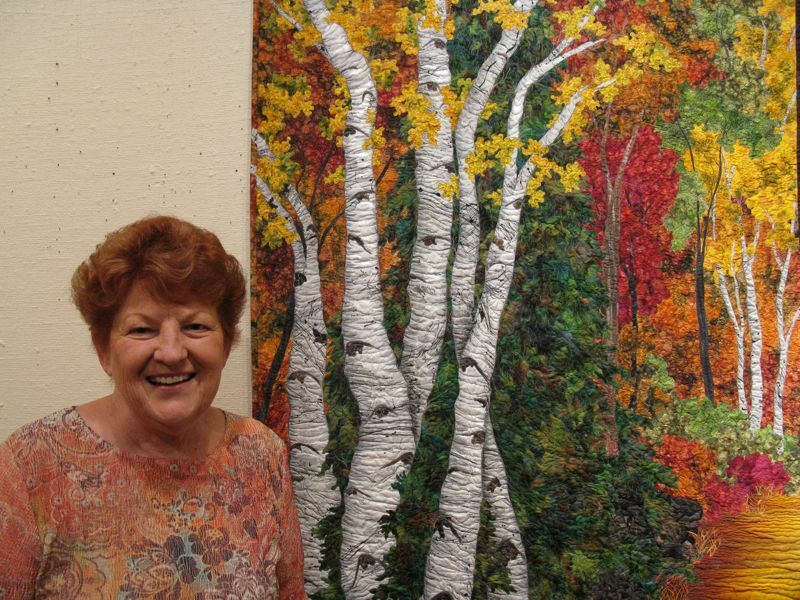 I love getting together with these fine women, and how fun it was to do it in a quilt show! 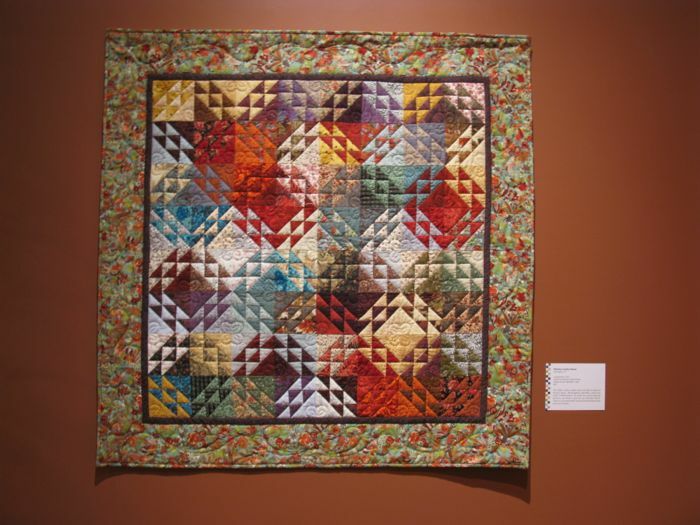 Thanks to the Springville Art Musuem, and the co-sponsors, Utah Valley Quilt Guild and Corn Wagon Quilt Company, for this lovely morning! 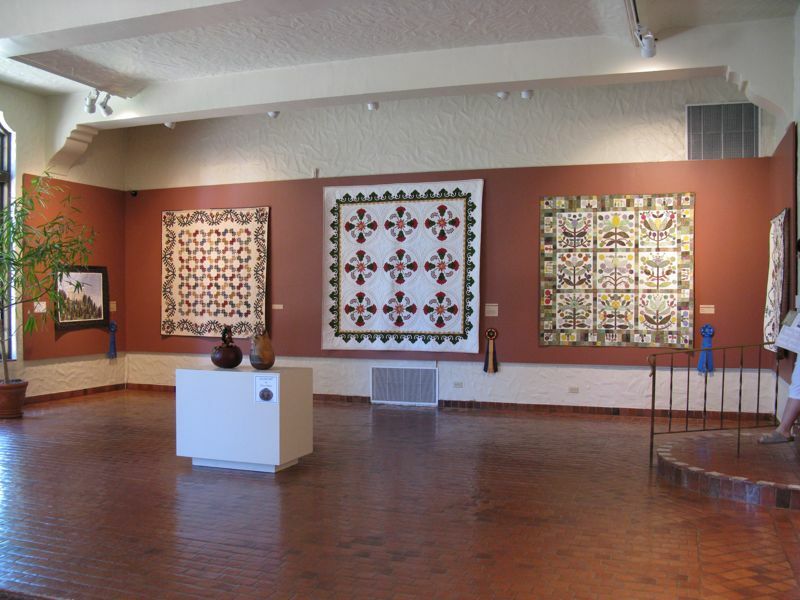 Posted on August 14, 2011 by Elizabeth E.
When I was in Utah last week, I slipped down to the Springville Art Museum for their annual quilt show. 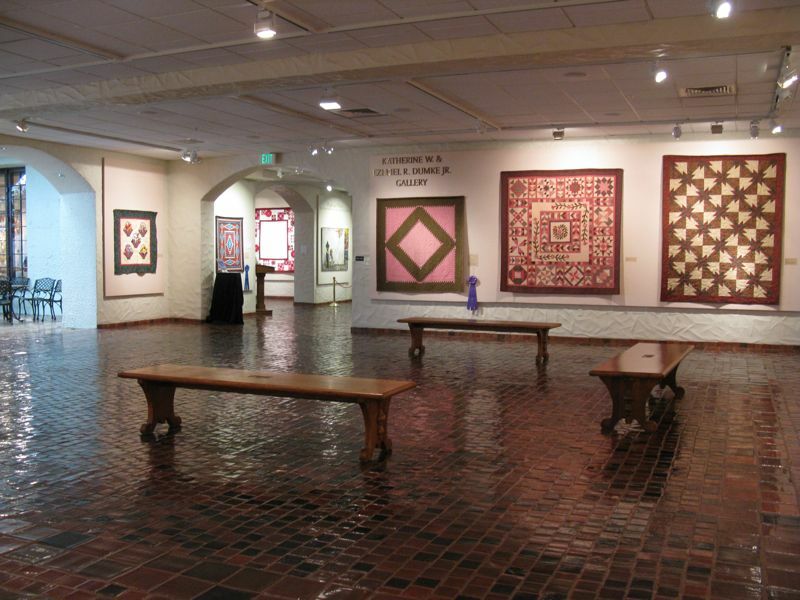 They have quite a reputation, and for those who are juried in, the honor of having their quilts displayed in a museum. 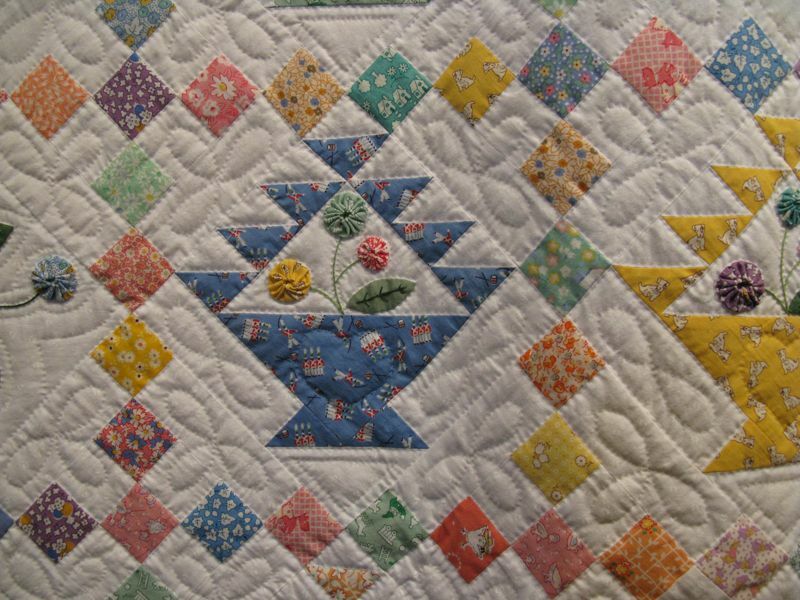 My sister-in-law, Scott’s mother, invited me down and I jumped at the chance to meet her and look at the quilts. 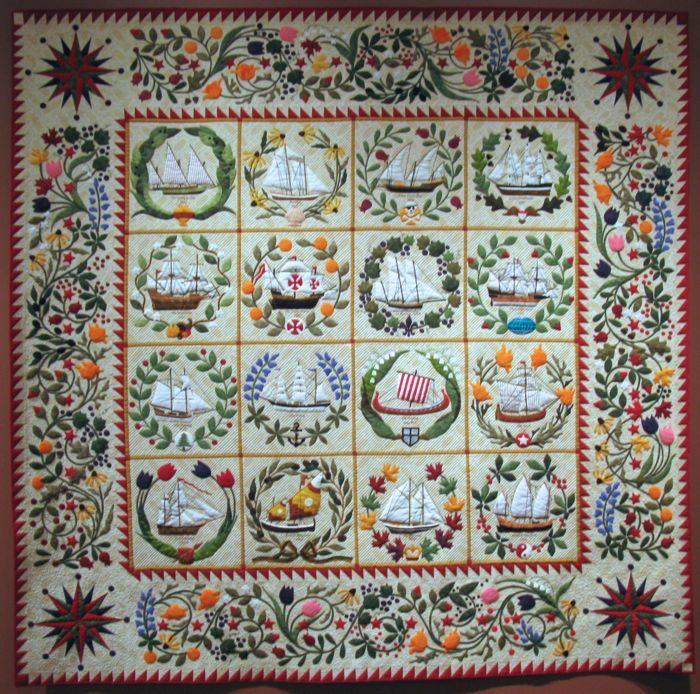 Generally I like to photograph the cards placed near quilts in a quilt show so I can add that information to any quilts I might put on this blog, giving credit to the maker/quilter. 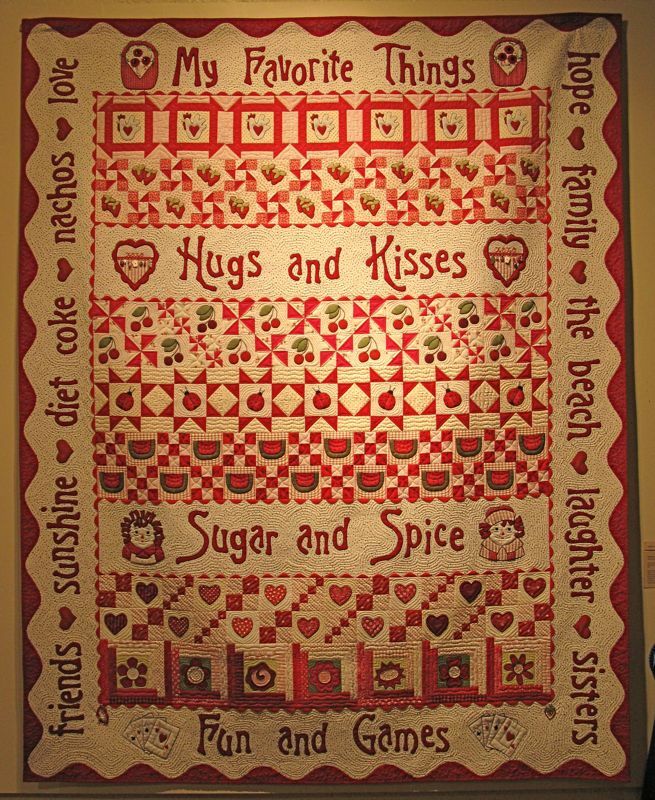 And I would give them to you, but — ahem — my desktop computer’s hard drive died today, so you’ll only get the quilt and the maker, with no details. Sorry about that. 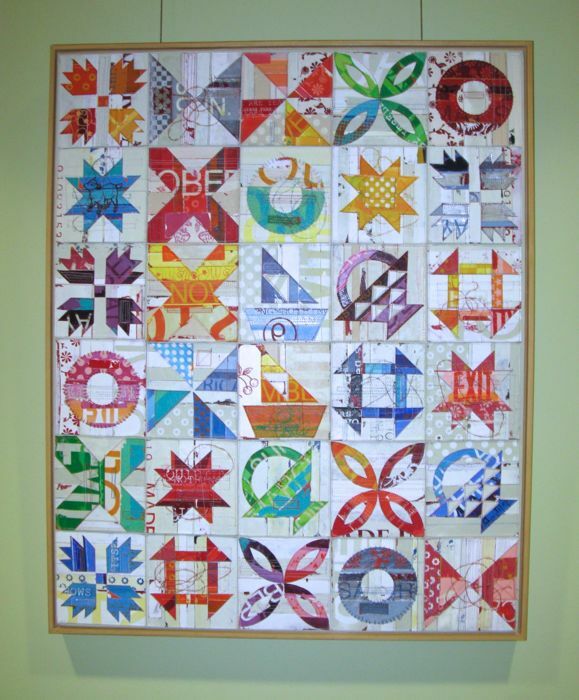 I liked Allison Babcock’s Stars of Glory, because of the interesting sashing around the outside of the blocks. 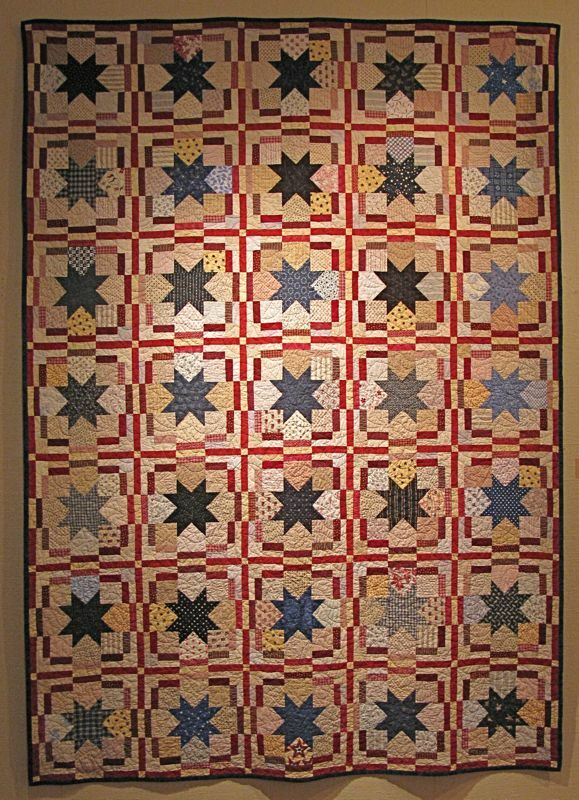 Sometimes something so simple can really pop up the interest on a tried-and-true favorite of stars in red, white and blue. For some reason, the only info I have on this is the last name “Baldwin” but that could be a wrong name. 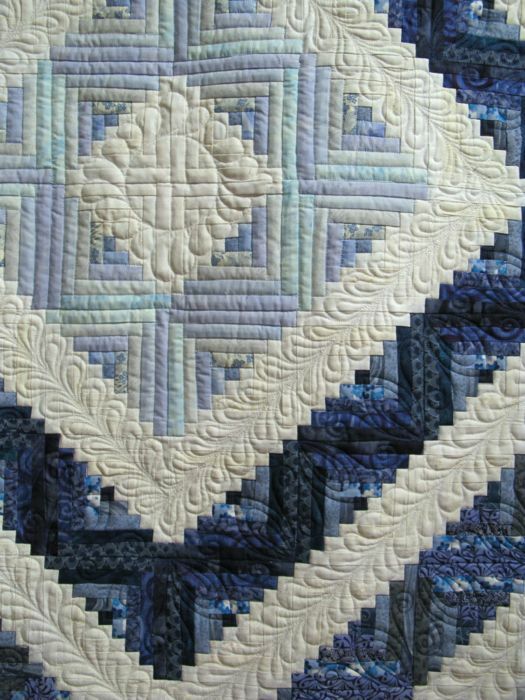 This was a beautifully done quilt with points crisp and perfectly formed. I was quite impressed. 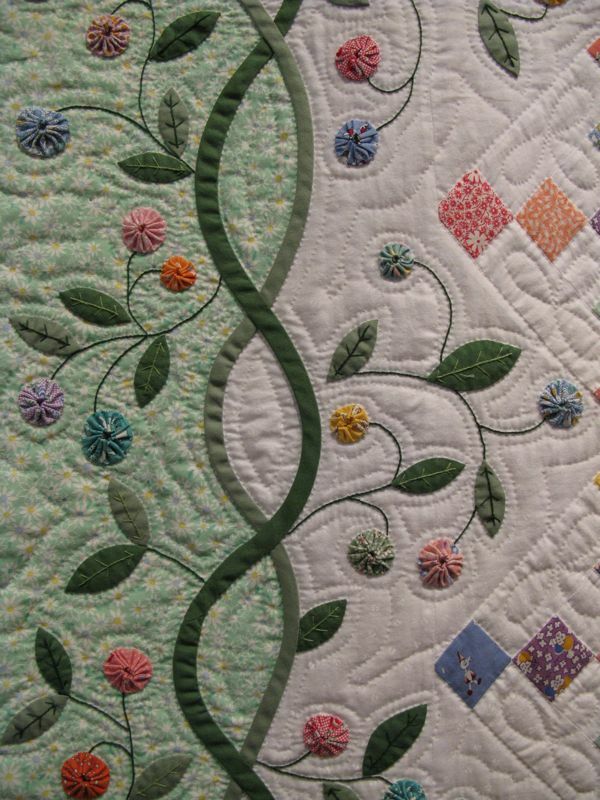 I also liked the quilting. 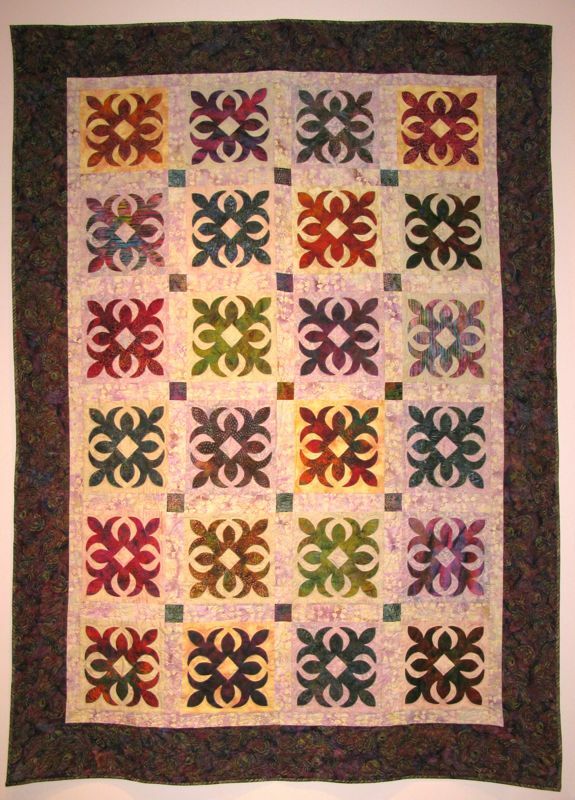 Cathryn Hulse made this, and it’s either Islands of Color, or Scraps of Rainbows. 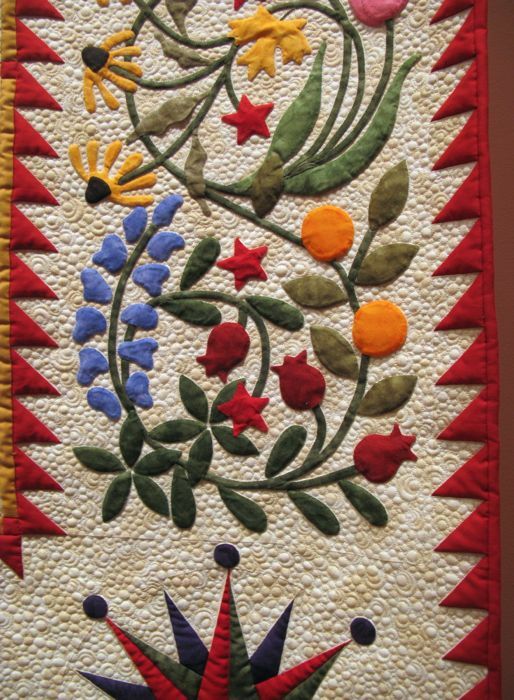 I’m voting for the former, because the applique reminds me of a Hawaiian quilt. 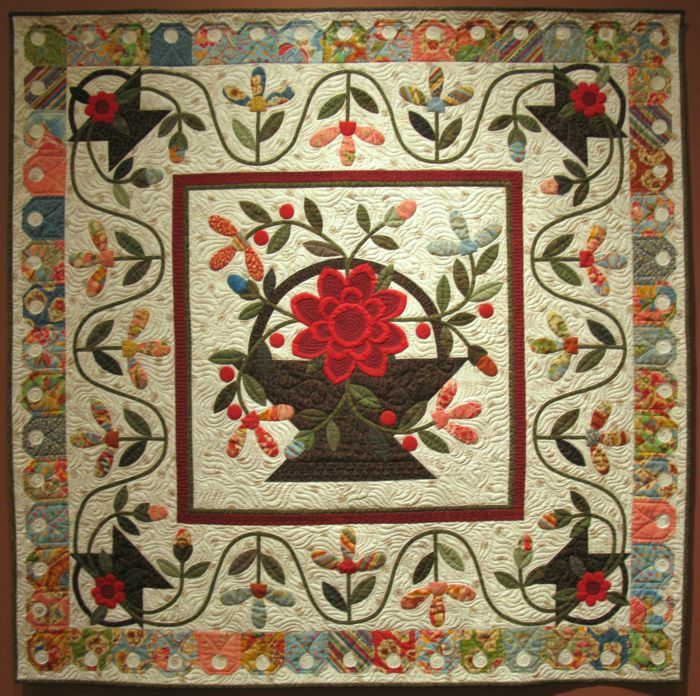 CharLee’s Flower Baskets was made by Cheryl Barlow. 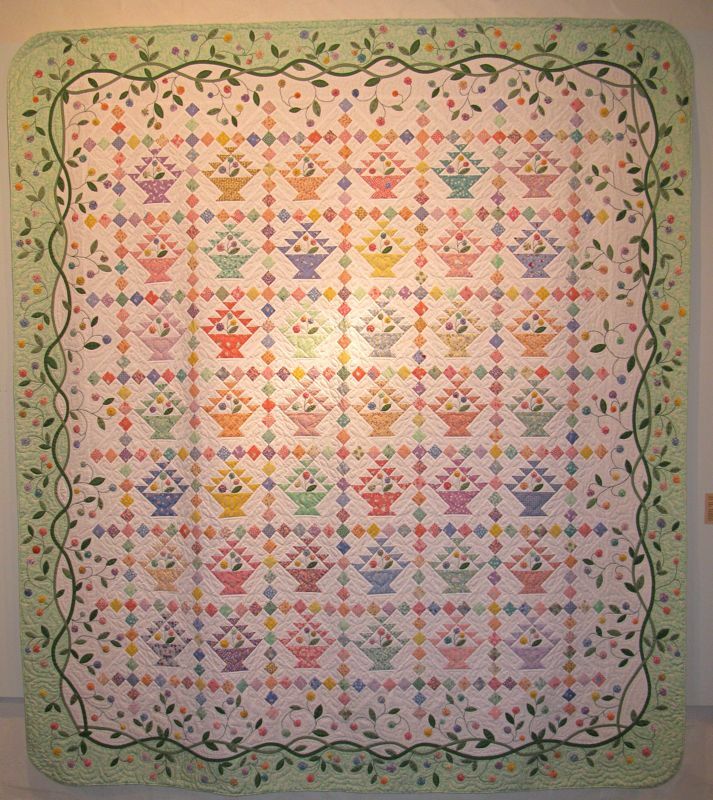 This whole room in the museum had a series of quilts done in pastels, with lovely applique work and inventive quilting. 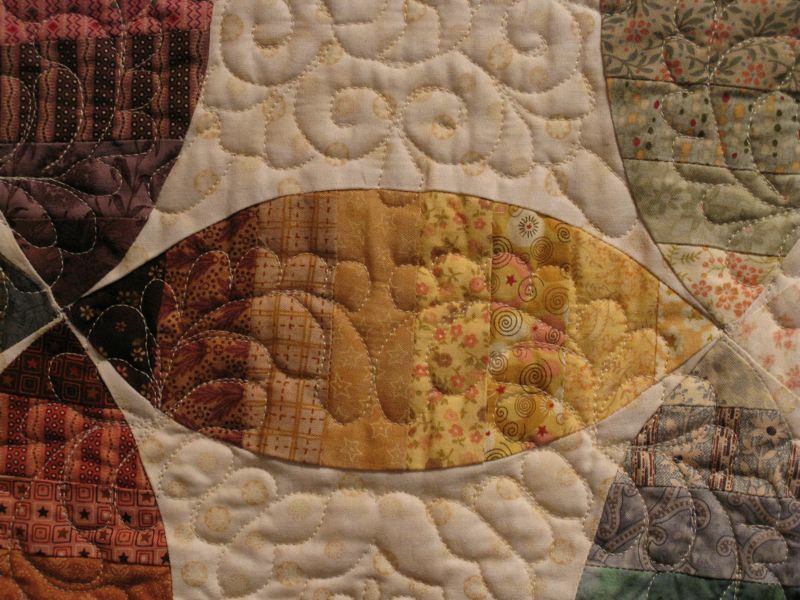 It was like tasting all the best ice cream flavors, but in quilting. 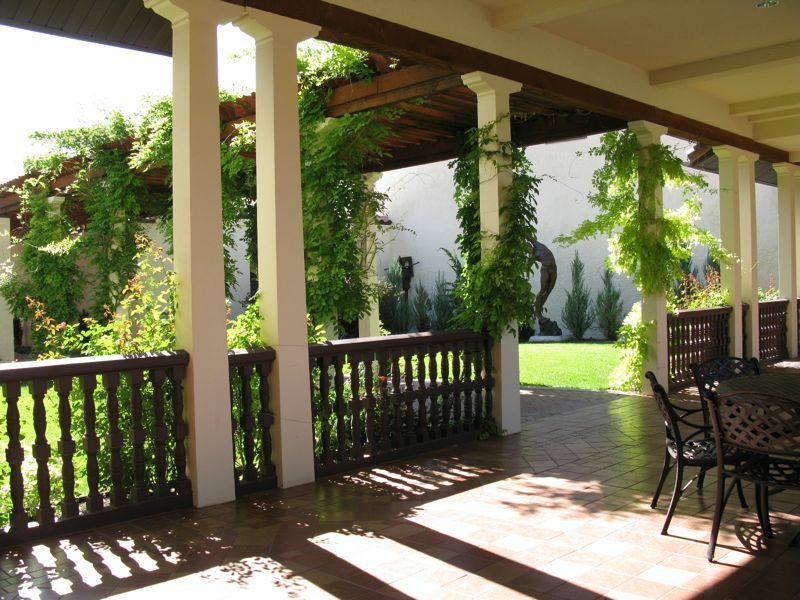 This is the patio, just outside the door. If I’d had more time, I would have stopped and enjoyed the sculptures in this garden. 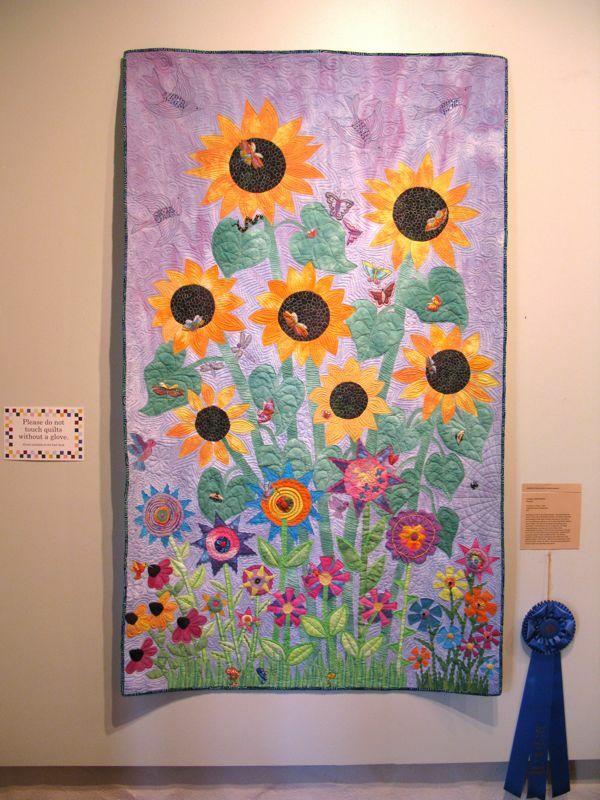 Francine Berrett made Blue Daisies and won a blue ribbon for her work. 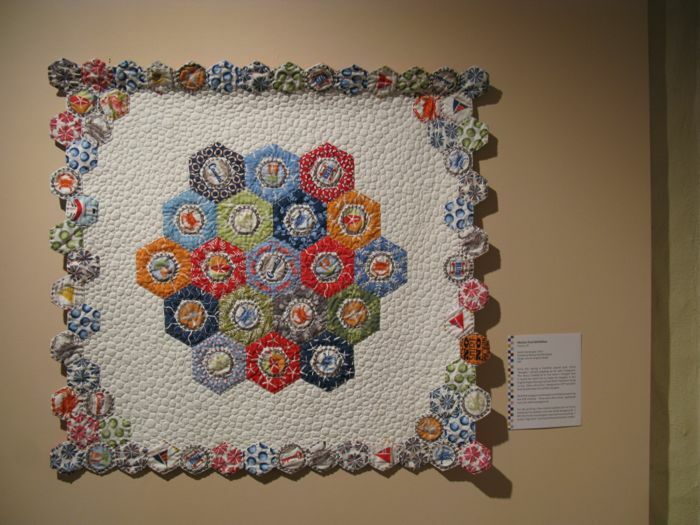 Ann Bowen’s quilt delivers such a nice visual impact. Upon closer look, though, we noticed all these signatures and messages of good will. 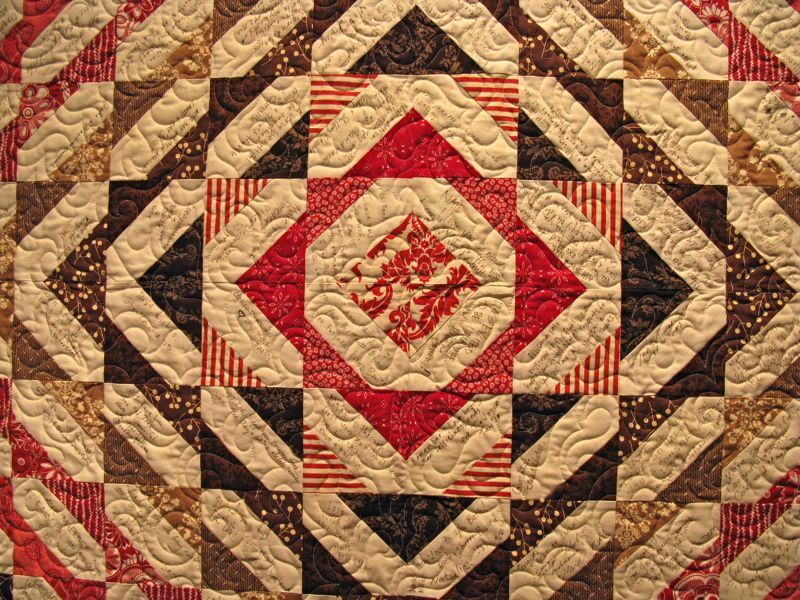 Then the title–The Perfect Beginning— finally clued us in: it was a quilt for a newlywed couple, perhaps signed at the reception by all the guests? It’s interesting what a snowballed block can look like when combined with other like blocks. 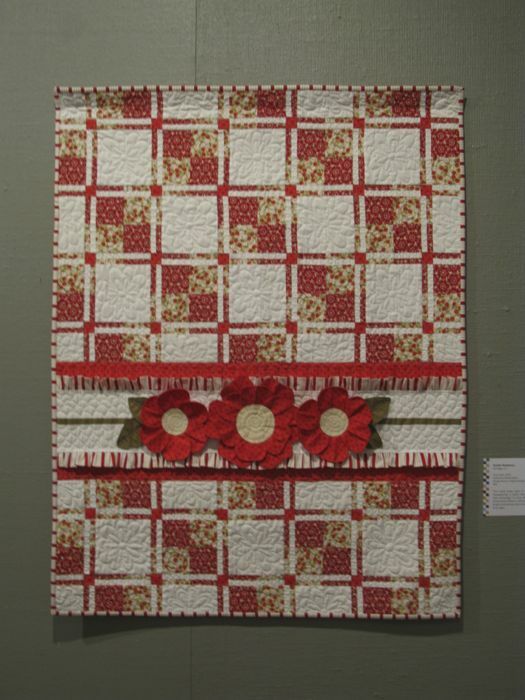 This houndstooth quilt by Brittany Burton is titled Baby Love. 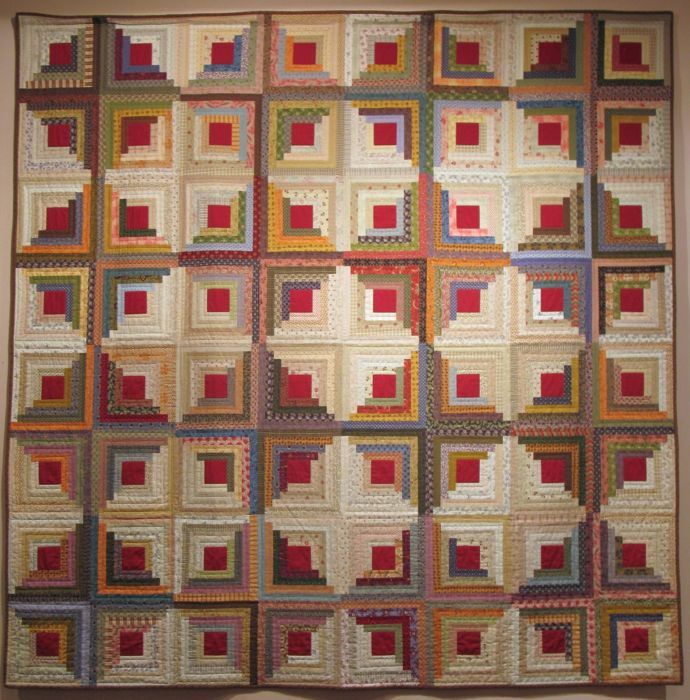 I’d never seen a houndstooth quilt before and I think this would make a great scrap quilt–she used lots of Kaffe Fasset fabrics to deliver the punched-up color scheme. 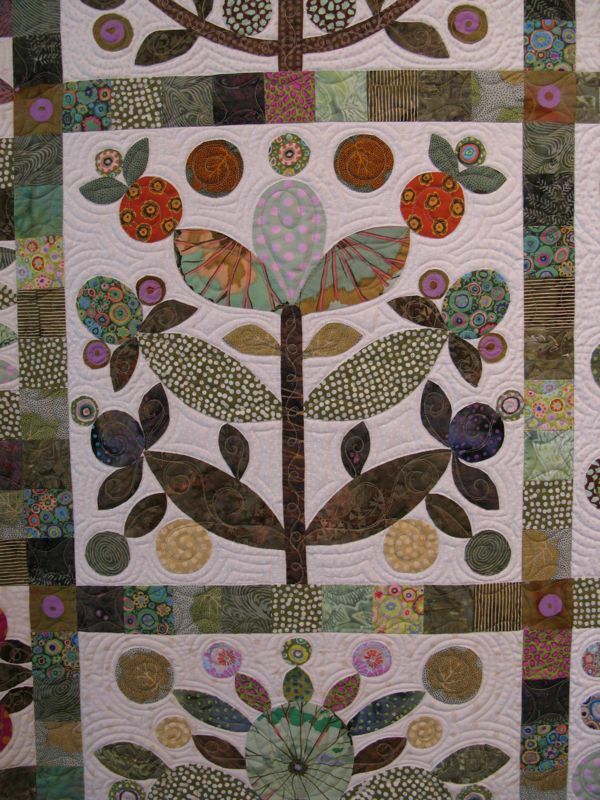 Laurel Christensen brings us Sunflower Forest, a jumble of flowers and grasses and colors and shapes–so wonderful. 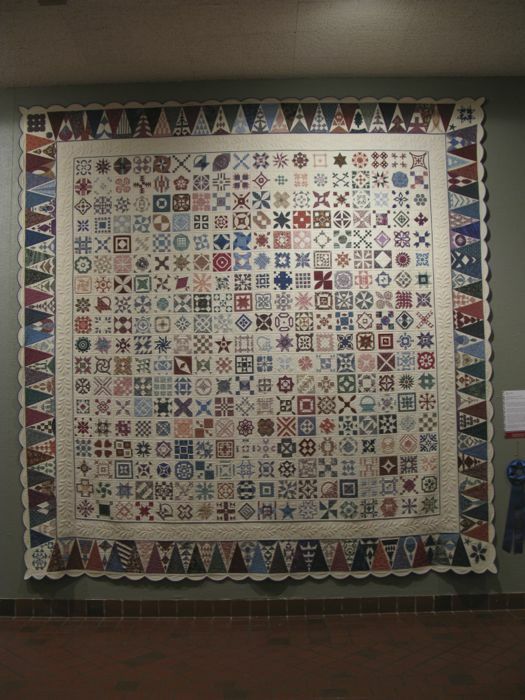 I was impressed with the high quality of the quilts in this show. I only saw one potential dud (shall remain nameless) and perhaps that evaluation was in the eye of this beholder. We ran into Susan Gilgen, as she walked around with some family members. 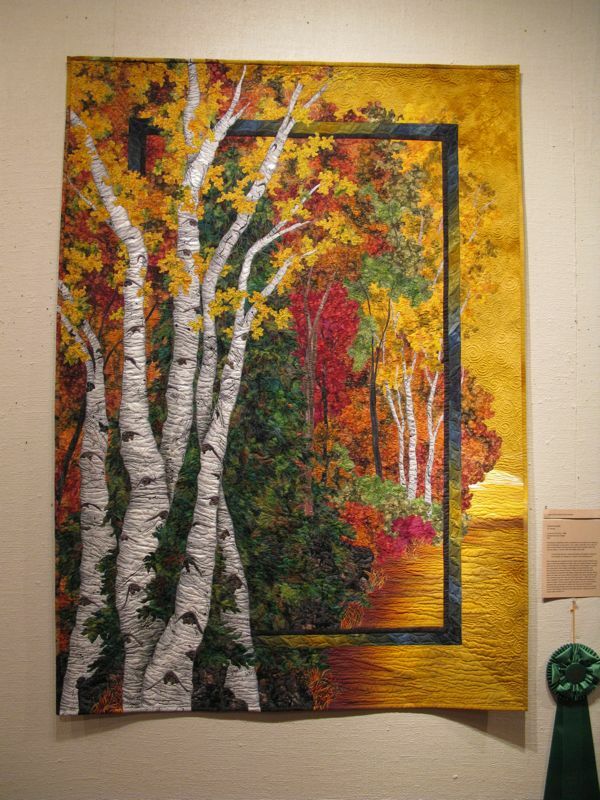 This quilt, Autumn Birches, had also been juried into the most recent Houston show, winning first place in the Art/Naturescapes category–it was a masterpiece! 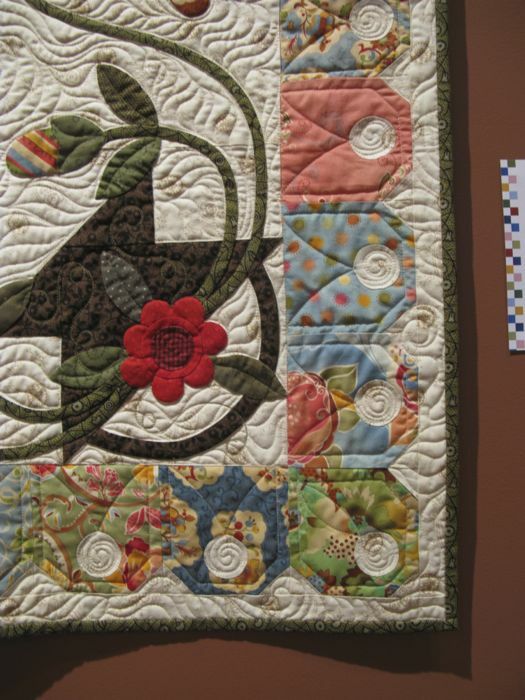 Fun to see a quilter with her work, don’t you think? Visit her at her website. Jackie Hadley and I have been thinking about the same thing this past year. 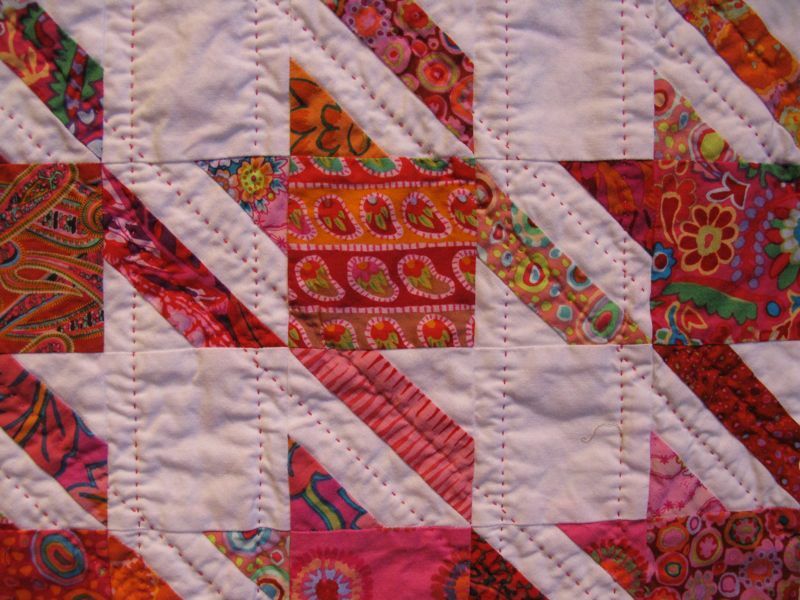 Her quilt, My Color Wheel, has a bit different finish on the outside borders than does mine, but so fun to see it! 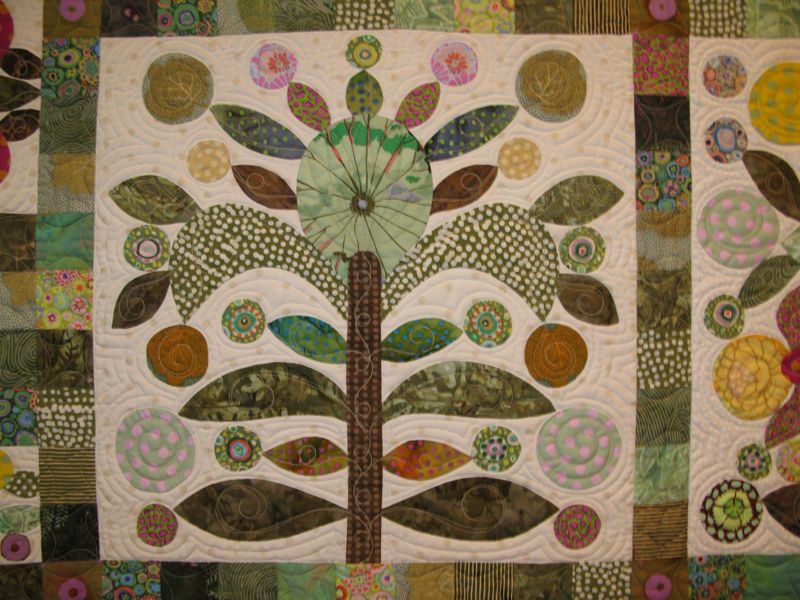 Carol Johnson, Have I Not Made the Earth? 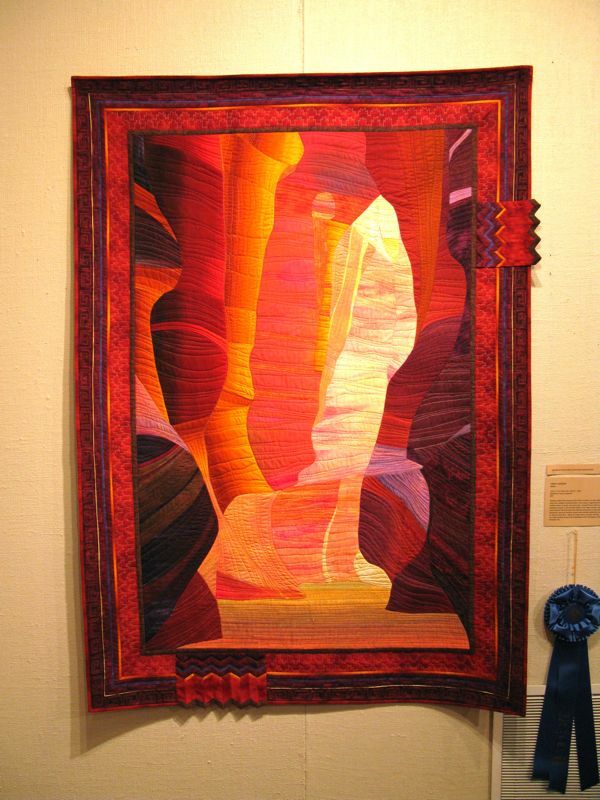 shows a slot canyon in Southern Utah, glowing in brilliant reds, yellows and ochre colors. 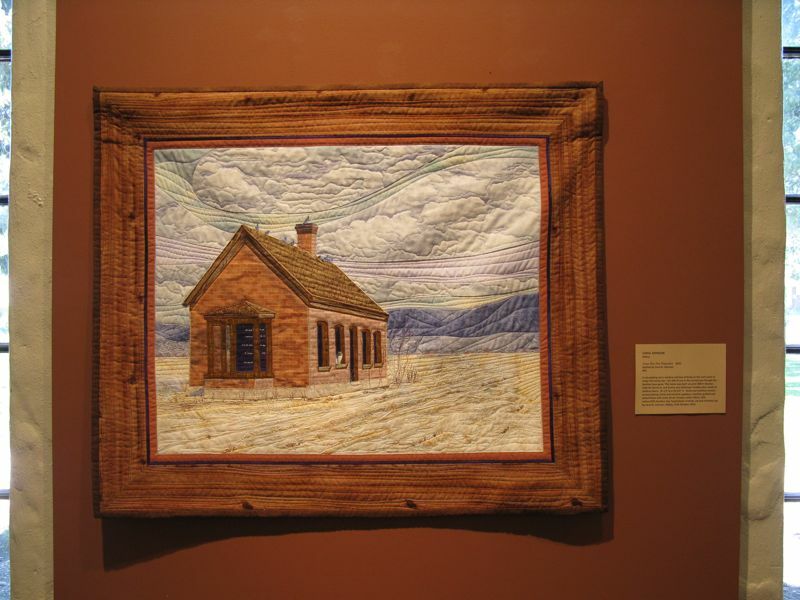 Last one for today: a rendition of non-extant old pioneer/family home, also by Carol Johnson. The title of this one is Gone, But Not Forgotten. 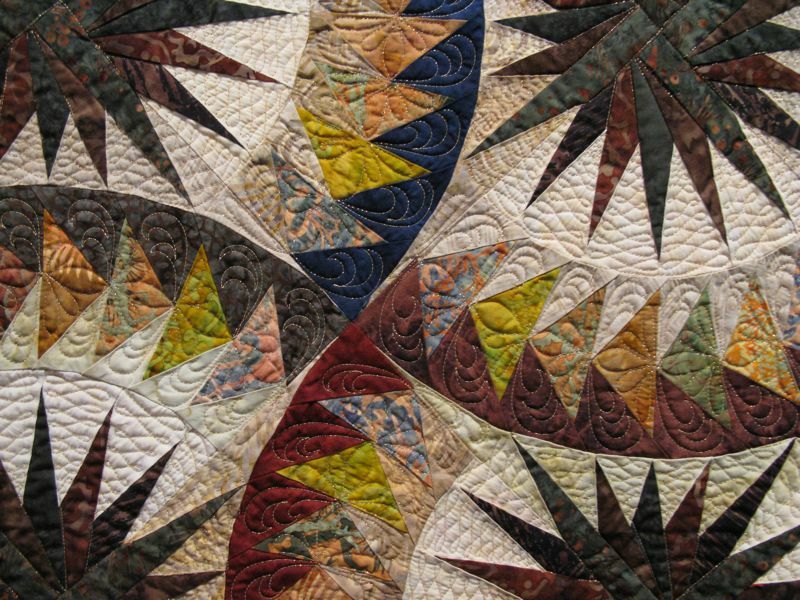 The quilting is amazing–you can see the wind flowing through the skyscape above, and regretfully, I didn’t get any close-up photos. Come back tomorrow for some more!